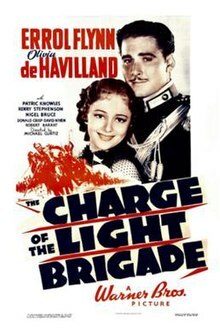 The Charge of the Light Brigade is a 1936 American historical adventure film made by Warner Bros. It was directed by Michael Curtiz and produced by Samuel Bischoff, with Hal B. Wallis as executive producer, from a screenplay by Michael Jacoby and Rowland Leigh, from a story by Michael Jacoby based on the poem The Charge of the Light Brigade by Alfred, Lord Tennyson. The music score was by Max Steiner; his first for Warners and the cinematography by Sol Polito. Scenes were shot at the following California locations: Lone Pine, Sherwood Lake, Lasky Mesa, Chatsworth and Sonora. The Sierra Nevada mountains were used for the Khyber Pass scenes. The film starred Errol Flynn and Olivia de Havilland. The story is very loosely based on the famous Charge of the Light Brigade that took place during the Crimean War (1853–56). Additionally, the story line includes an event similar to the Siege of Cawnpore during the Indian Rebellion of 1857. This was the second of eight films in which Errol Flynn and Olivia de Havilland starred together. A latter film was made in 1968, under the same name, The Charge of the Light Brigade and starred Trevor Howard and Vanessa Redgrave. In 1854, Major Geoffrey Vickers (Errol Flynn) and his brother, Captain Perry Vickers (Patric Knowles), are stationed in India, with the 27th Lancers of the British Army. It is during the period of East India Company dominance over the Indian subcontinent. Perry has secretly betrayed Geoffrey by stealing the love of his fiancee Elsa (Olivia de Havilland). During an official visit to local tributary rajah, Surat Khan (C. Henry Gordon), Geoffrey saves the rajah's life while hunting, for which the rajah promises eternal gratitude. Later, Maj. Vickers is stationed at the British garrison of (fictional) Chukoti, along with British military families, within the part the North-Western Frontier controlled by Surat Khan. A British miscalculation leads to premature withdrawal of troops to (fictional) Lohora, unnecessarily exposing Chukoti. Faced with an overwhelming siege, the British commander, Col. Campbell (Donald Crisp), surrenders Chukoti to Surat Khan, who then massacres the inhabitants, including British families. Surat Khan allies his forces with Imperial Russia, whom the British are fighting in the Crimean War, but spares Maj. Vickers and Elsa as they flee the slaughter. This repays his debt to Geoffrey. The love triangle and the quest for vengeance resolve at the Battle of Balaclava. Aware that Surat Khan is inspecting Russian positions opposite the 27th Lancers, Maj. Vickers secretly replaces written orders by Sir Charles Macefield (Henry Stephenson) to the commander of the Light Brigade, Sir Benjamin Warrenton (Nigel Bruce), to withdraw from the Balaclava Heights. Vickers instead orders the famous suicidal attack so the lancers can avenge the Chukoti massacre. Before the charge, Maj. Vickers reminds troops of the Chukoti Massacre and directs their anger: "Our objective is Surit Khan!" Although the 27th Lancers lose nearly all their 600 strength, they successfully breach Russian artillery positions. There, Vickers finds and kills Surat Khan, at the cost of his own life. Later, it emerges that Maj. Vickers wrote to Sir Charles Macefield explaining his actions, a note which he forced his brother Perry to deliver, under threat of court martial, so sparing his brother almost certain death. After receiving Maj. Vickers' explanation of why the charge happened, Macefield takes responsibility and burns the note to protect Vickers' good name. The charge had been portrayed in a British movie, The Jaws of Death, in 1930. Warner Bros were inspired to make the film after Lives of a Bengal Lancer (1935) had been released to great popularity, ushering in a series of British Empire adventure tales. Michel Jacoby had developed a story based on the famous charge but, although Warners bought Jacoby's script, the final script was closer to Lives of a Bengal Lancer. An original working title was The Charge of the 600. Warners wanted an all-British cast. Errol Flynn (Australian, but often considered Irish) had made such a strong impression in Captain Blood he was removed from supporting Fredric March in Anthony Adverse to play the lead in Charge of the Light Brigade. Ian Hunter was connected to the film early on. Anita Louise was announced as the female lead. Patric Knowles had just joined Warner Bros at the recommendation of Irving Asher in London, the same man who recommended Errol Flynn. He was given the crucial support part of Flynn's brother. The movie gave an early important role for David Niven. Edward G. Robinson tested for the role of the lead villain Surat Khan. Basil Rathbone was also considered before C Henry Gordon was cast. During filming on location at Lone Pine California the unit helped put out a fire which started at a restaurant across the road from where the actors were staying. There was some shooting done in Mexico where there were fewer restrictions on hurting animals. The film comes to a climax at the Battle of Balaclava, subject of Lord Tennyson's poem The Charge of the Light Brigade. The lancers charge into the valley and brave the Russian cannons, and many are killed. Text from Tennyson's poem is superimposed on the screen, coupled with Max Steiner's musical score. Director Michael Curtiz, who did not have an excellent command of English, shouted "Bring on the empty horses", meaning "riderless horses". David Niven used this as the title of his book about the Golden Age of Hollywood. The battlefield set was lined with tripwires to trip the cavalry horses. For the filming of the climactic charge, 125 horses were tripped; of those, 25 were killed or had to be put down afterward. Errol Flynn, an accomplished horseman, was outraged by the animal cruelty and by director Michael Curtiz's seeming indifference and attacked Curtiz. They were pulled apart before any serious damage was done. The charge sequence forced the U.S. Congress to ensure the safety of animals in motion pictures; the ASPCA followed suit and banned tripwires from films. Unlike Flynn's other blockbuster films, because of the number of horses killed, it was never re-released by Warner Brothers, and so wouldn't be seen again until 1956, when Warner Brothers sold the rights to it and other pre-1950 films to Associated Artists Productions and it subsequently premiered on television. "This production has its basis in history. or dead, is intended or should be inferred." The film was a massive hit in Japan. According to Warner Bros' accounts, the film was the studio's most expensive and most popular film of 1936, earning $1,176,000 domestically and $1,560,000 foreign. Jack Sullivan won the Academy Award for Best Assistant Director for his work on the film, and the film was also nominated for the Academy Award for Sound (Nathan Levinson) and the Academy Award for Original Music Score. ^ Variety film review; November 4, 1936, page 18. ^ Harrison's Reports film review; November 7, 1936, page 178. ^ Tennyson 's Celebrated "Charge of the Light Brigade " Inspiration for New Film: Miss Colbert Will Be Star of 'Frenchy' Moroni Olsen Given Musketeer Role; Jones to Sing Schallert, Edwin. Los Angeles Times (1923-Current File) [Los Angeles, Calif] 13 June 1935: 13. ^ Chaplin's Big Business: Goldwyn's Leading Lady: A New Romantic Hero Bain, Greville. The Times of India (1861-current) [New Delhi, India] 07 Mar 1936: 9. ^ Irvin S Cobb, Famous Humorist, Signs to Star at Twentieth Century-Fox: Zanuck Picks Story for Writer-Player Francine Larrimore Arriving October 20 to Do Picture Work for M.-G.-M.; Featured Roles Awarded Melvyn Douglas Schallert, Edwin. Los Angeles Times (1923-Current File) [Los Angeles, Calif] 18 Sep 1935: 9. ^ SCREEN NOTES New York Times (1923-Current file) [New York, N.Y] 20 Mar 1936: 28. ^ Irvin Cobb, Film Future Secure, to Star in "Gentleman From Mississippi": Writer's Thespianic Adventure Proceeds Claude Rains and Charles Boyer Both Will Have Fling at Napoleon Interpretation; Choir Singer in "Stagestruck" Schallert, Edwin. Los Angeles Times (1923-Current File) [Los Angeles, Calif] 09 Mar 1936: 15. ^ Bette Davis, Academy Winner, Will Break Up Film Duties With Vacation: Star Going to Palm Springs, Honolulu Randolph Scott Will Portray Scout Hawkeye in "Last of Mohicans;" Sol Lesser Plans Films for Twentieth-Century Release Schallert, Edwin. Los Angeles Times (1923-Current File) [Los Angeles, Calif] 07 Mar 1936: 5. ^ Franchot Tone Selected to Appear Opposite Jean Harlow in "Suzy" Film: George Fitzmaurice Will Direct Feature Harriet Hilliard's Next Picture Will Be "Make a Wish;" Capra Seeking Tibetans; Beverly Roberts Wins Leading Part Schallert, Edwin. Los Angeles Times (1923-Current File) [Los Angeles, Calif] 20 Mar 1936: 15. ^ Jungle Scene Gives Actors Extra Thrill Shaffer, George. Chicago Daily Tribune (1923-1963) [Chicago, Ill] 15 Apr 1936: 22. ^ Movie Crew Aids Firemen New York Times (1923-Current file) [New York, N.Y] 02 Apr 1936: 29. ^ NEWS OF THE SCREEN: Forward the Light Brigade, to Mexico -- More Costumes for Hepburn -- Trivial Matters. New York Times (1923-Current file) [New York, N.Y] 15 June 1936: 24. ^ "The 9th Academy Awards (1937) Nominees and Winners". oscars.org. Retrieved 2011-08-08. Wikimedia Commons has media related to The Charge of the Light Brigade (1936 film). This page was last edited on 18 March 2019, at 16:01 (UTC).